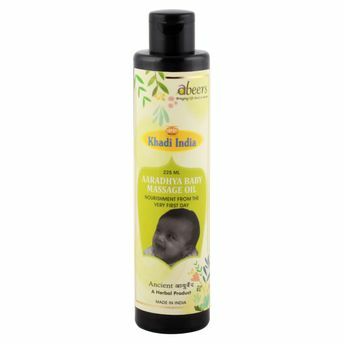 Khadi Abeers Aaradhya Baby Massage Oil is 100% natural, deep nourishing and calming baby massage oil extremely beneficial for newborns. This oil is soothing, moisturizing and gentle on baby's skin and provides essential nourishment to the skin. Enriched with ayurvedic ingredients, the Abeers Aaradhya Baby Massage Oil softens and soothes skin. Additional Information: Abeers Gramudyog is the manufacturer of herbal beauty, natural skin care, concentrates oils, & hand washes. Abeers Khadi products are made up of natural ingredients and are free from chemicals and preservatives. With an extensive range of products right from medicines, ayurvedic supplements, ayurvedic oils and herbal ayurvedic cosmetics, the brand visions providing scientifically validated Ayurveda solutions for the entire family.